The Berkeley Arts Council presents and exhibit by Teaching Artists Jean Kellogg and Judith Becker, which will show their work in the media they will be teaching starting in September. The exhibit is in the Back Space at the Berkeley Art Works, 116 North Queen Street in Martinsburg. The exhibit will be on display through August 23. Judith Becker demonstrates color pencil techniques to a group of budding artists as part of the Berkeley Art Works “Mini-Lesson” series. For those who have thought about taking an art class or trying a new painting medium but didn’t know what was involved, Here is a chance to find out about it free. Get a taste of acrylic, watercolor, and oil painting and more with free one hour mini-lessons being offered in August. 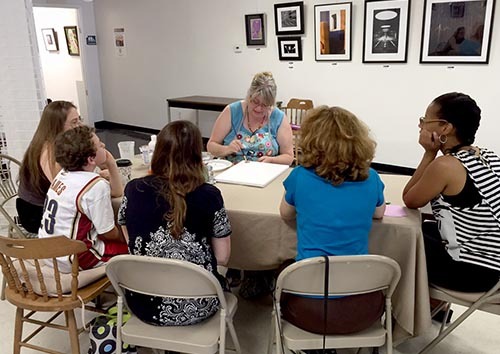 Jean Kellogg demonstrates basic acrylic painting as part of the Berkeley Art Works “Mini-Lesson” series. 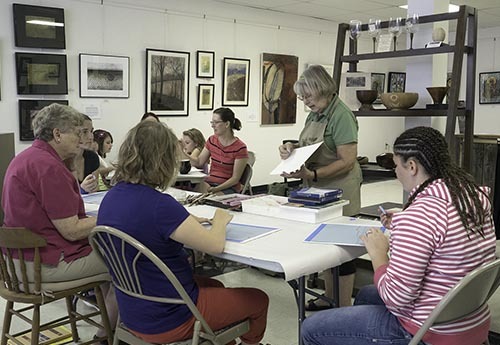 The full schedule of Fall classes and mini-lessons is available at http://artworks.berkeleyartswv.org/instruction/.